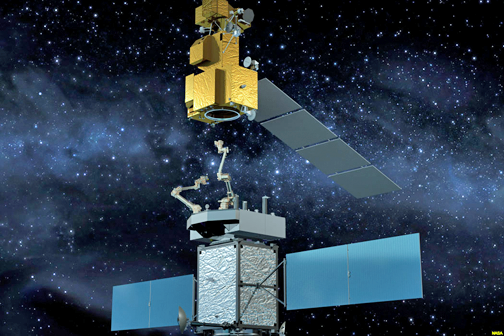 Space Systems Loral (SSL) has completed the Systems Requirements Review (SRR) for the Restore-L project that will demonstrate satellite servicing in LEO. As announced on December 9, 2016, SSL is working with NASA Goddard Space Flight Center to build a spacecraft that will use robotics to grasp, refuel, and relocate an existing US government satellite already in LEO orbit with the goal of demonstrating tools, technologies, and techniques that can be implemented on future government and commercial missions. Artistic rendition of the Restore-L program in operation. The SRR, which occurred over a two-day period at the SSL satellite manufacturing facility in Palo Alto, California, enabled the SSL and NASA teams to work together to review and verify the functional and performance requirements defined for the Restore-L spacecraft. The requirements that the teams agreed upon will drive modifications to the SSL 1300 platform, which is commonly used for commercial missions in geostationary orbit. The spacecraft will provide the structural support, propulsion, attitude control, data and communications interface, and power to support the Restore-L robotic payload for the on-orbit demonstration. SSL is contributing to a variety of next-generation government missions, including a NASA Discovery Mission to explore the metal asteroid called Psyche as well as the Dragonfly program, which will demonstrate on orbit satellite assembly.